On a late spring day my colleague and I arrived at the Virginia Robinson Estate at the end of Elden Way, a cul-de-sac just a stone’s throw from the famed Beverly Hills Hotel. We parked on the street and headed through the only open gate to the property where presumably the tour began. As we trekked up the driveway, a man flung himself out the front door of a building adjacent to the driveway as if he was impersonating Cosmo Kramer from an episode of Seinfeld; warning us to return to our car and drive to the tour entrance. Good thing we heeded “Kramer’s” advice because the tour began at the top of the hill, not the bottom; it otherwise would have been a good quarter mile of uphill walking. We returned to our car and drove up a long winding private driveway, past a few parking alcoves, but wisely continued to the end of the road at the top of the hill. The tour began in the pool house, a separate structure among other secondary structures including servants’ quarters and a service garage. Built in 1911, the Robinsons moved into their stately manor while the iconic Beverly Hills Hotel was still about a year away from completion and about three years prior to the onset of World War One. The pool house is quite impressive; filled with the same level of elegant furnishings and art as the manor, but serves mostly to receive and entertain guests. Situated between the manor and the pool house, the pool was disappointingly ordinary. While expecting an elegant but functional recreational water feature that harmonized with the pool house, the pool was simply a utilitarian rectangular medium-size lap pool; lacking accoutrements such as a diving board or platform which ubiquitously complement countless contemporary southern California pools. Although analogous to most modern middle-class pools, its setting sets it apart; framed by a well manicured lawn sporting crane statues, century old sago palms (Cycas revoluta) and a clear view of the primary residence. With balmy weather throughout the year, Mrs. Robinson included a daily regimen of swimming laps in her garden pool; perhaps contributing to her remarkable 98-year life. Curiously, the small pond at one end of the pool is a remnant of the original pool. As we made our way to the manor, we were prompted by the docent to withhold judgment of its modest size and architectural details compared to its contemporary counterparts; because most people associate gentry with enormous, grandiose and opulent mansions. What the manor lacks in scope and lavishness, it makes up for with a warm and charming ambiance. While the indoor portion of the tour reveals many treasures, the star of the experience is the garden with its cornucopia of plants from all over the world. 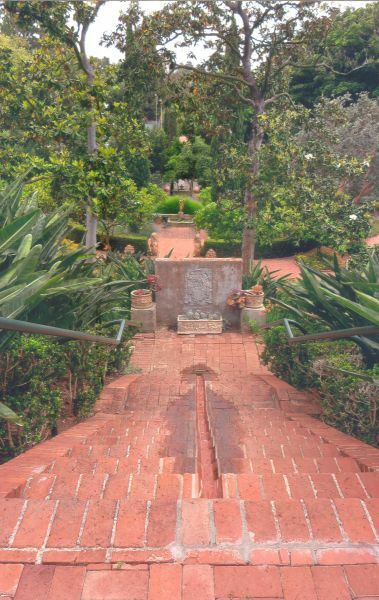 Some plants are well over 100 years old including a dramatically displayed Moreton Bay Fig tree (Ficus macrophylla) which leans over a steep hillside with its aerial roots cascading down to support the horizontally opposed trunk giving the appearance of a living train trestle. One of Mrs. Robinson’s favorite trees located in one of her favorite spots in the garden is a mature Ginkgo tree (Ginkgo biloba); which shades a secluded patio where babbling water from a fountain contributes to the serenity. A feast for the sense of smell, there are several areas planted with aromatic plants such as lavender and bay laurel or sweet bay (Laurus nobilis); just stand for a few moments with your eyes closed and take a whiff of the fragrant bouquet. Locals who are familiar with the postcard perfect Coral trees (Erythrina caffra) lining the median on San Vicente Boulevard should be grateful to the Robinsons for donating cuttings from the estate’s prized specimen. Coral trees are not only stunning, especially when in bloom, but are also the official tree of Los Angeles (cultural monument #148). Other dramatic highlights of the tour include a shady Australian King Palm forest and rose garden with magnificent heirloom varieties. Some botanical jewels on the estate that may only be seen from a distance or not seen at all consist of Fuyu persimmons (Diospyros kaki ‘Fuyu’), apples, peaches and sapote trees. From bean fields to the Garden of Eden, the Virginia Robinson Gardens is a magnificent feather in southern California’s cap. Reserving a tour is an easy way for the hoi polloi to experience the lifestyle of aristocrats from a bygone era. Be sure to wear appropriate walking shoes as you will traverse steep hillsides and sometimes along slippery paths. Virginia Robinson estate provides guided tours by appointment only, Tuesday through Friday at 10:00 a.m. or 1:00 p.m. Call (310) 550-2065 or e-mail at visit@robinsongardens.org to make a reservation; no online tickets are available. Ticket prices are adults $11.00, children (5 to 12 years of age) $4.00, students with student identification $6.00 and senior citizens (62+ years of age) $6.00.